“Big as them and twice as smart.” In Jenifer Nii’s Ruff!, a short play (30 minutes) about two dogs in a shelter which is geared toward children in K-3, Axel and Buddy become friends, sharing experiences that offer plenty of lessons about bullying, identity, self-esteem and confidence, and the challenge of stepping forward without fear. Actors Tyson Baker and Latoya Rhodes in Ruff!. The play will be premiered with six free performances at the Sprague Library as part of the inaugural Great Salt Lake Fringe Festival (August 6-9). The latest production in Plan-B Theatre’s Free Elementary School Tour (FEST), Ruff! will hit the road this fall with performances that will reach more than 10,000 elementary students from Weber to Juab County, and is supported by an Art Works grant from the National Endowment for the Arts. 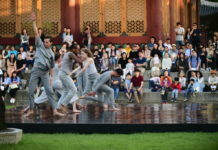 The premiere performances will take place Aug. 6, 7 and 8 at noon and 1:30 p.m. 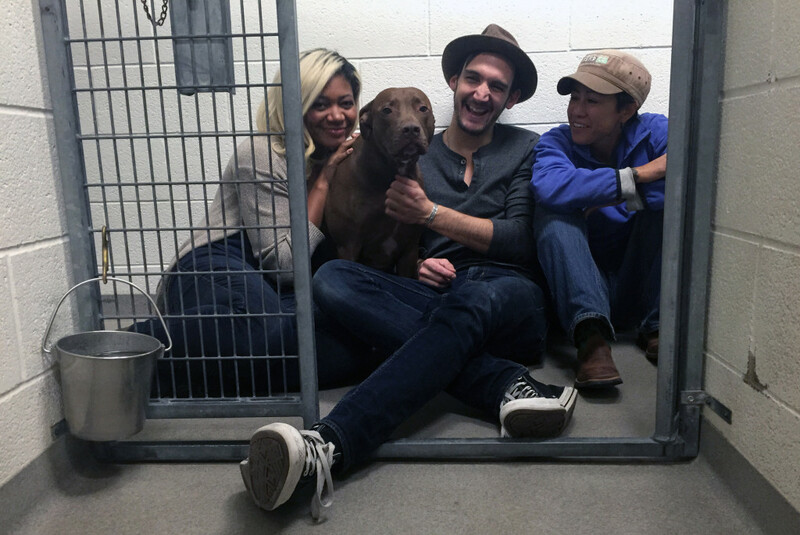 Actors Tyson Baker and Latoya Rhodes will take the roles of Axel and Buddy, respectively. This is Nii’s fourth play for Plan-B, which includes two works (The Scarlet Letter and Suffrage) being nominated for the American Theatre Critics Association/ Steinberg Award for the Best New American Play Produced Outside New York. A former newspaper reporter who once had trained to be a concert pianist, Nii now devotes her time to writing plays and training dogs. And, as part of the premiere, Intermountain Therapy Animals will have dogs present at each performance, supplementing the theatrical experience with opportunities for children to interact with the animals. One of the newer program components for the company which will celebrate its 25th anniversary this season, Plan-B has seen its FEST program flourish as it enters its third year, thanks to the solid success of Matthew Ivan Bennett’s Different=Amazing and a production of Sergei Prokofiev’s Peter and The Wolf, in conjunction with the Gina Bachauer International Piano Foundation. Recently, Nii and Jerry Rapier, Plan-B’s producing director, did an email interview for The Utah Review, answering questions about Ruff! and the FEST program. TUR: This play incorporates many different types of experiences and source material and it emerges as a really substantive work especially for young audiences. What were some of the driving underlying criteria and principles you used to develop this work? Nii: I had two primary goals: (1) Tell a meaningful story, and (2) don’t be boring. RUFF! follows a profoundly important, wonderfully crafted play, DIFFERENT=AMAZING, which toured Utah schools last year. That production really impressed upon me what a unique and powerful opportunity we have as part of this partnership to reach out to young people. I wanted to do my best to provide something that would resonate with the kids who’ll be seeing the play — in a way that honors their experience AND entertains. Rapier: When I approached Jenifer about writing for our Free Elementary School Tour she asked me if I was crazy. 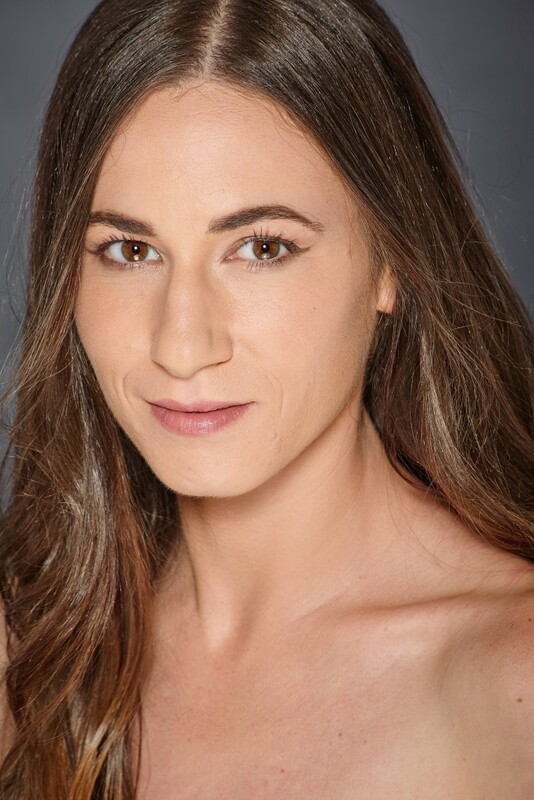 Although she had never written theatre for young audiences, she’s a fantastic dog trainer and one of the most thoughtful playwrights in Utah. I felt that combining her work as a dog trainer and her skill as a playwright could be really exciting. TUR: What are the particular challenges you find in writing plays for young audiences as compared to other projects? Nii: This is my first play for young people. I had to really get past the fact that I had no real experience with children — I don’t have any, know relatively few, and fear I scare most — and focus on telling a streamlined story as tightly and as interestingly as I could. What I learned is that aside from cutting out the fat — all the waxing poetical parts had to go, which was a good thing anyway — telling this story was pretty similar to the other plays I’ve written. Just with puppy hats. Rapier: The only difference between young audiences and adult audiences is that the young ones are far more willing to suspend their disbelief and go along on the ride with you. They are also far more willing to tell you the ride isn’t worth it. They are the most honest audiences you could possibly play to so, if you can make the ride worth their time, there’s nothing more rewarding. TUR: There are several significant takeaways for children, teachers, parents and anybody else who will see this work. And, then there is the benefit of having service and therapy animals on hand which really simplifies the holistic experience of the impact of live theater for young audiences. Your comments on this would be appreciated. Nii: My hope is that people who see the play will see something or someone they recognize, and feel more freedom to act. Whether it’s a kindergartner who’s wondering whether to say hello to a new classmate, a teacher looking at a diamond-in-the-rough student, or parents who want to make their school better. My hope is that they’ll feel a little more able, a little less doubtful of their ability to make a difference. 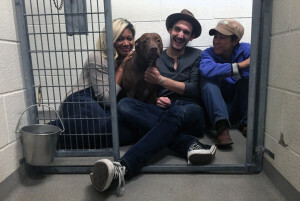 Also, as a professional dog trainer and animal rescue advocate, I hope this play will make lots of kids think about getting their next pet from a shelter or reputable rescue, and training and caring for that pet well. Rapier: If one child learns to understand canine behavior a little better, then the production is a success. And if one child translates that to how he or she interacts with other kids, well that’s amazing. TUR: Plan-B is developing a major platform in doing work geared toward younger audiences and schools appear to be warmly receptive to having this type of programming available. 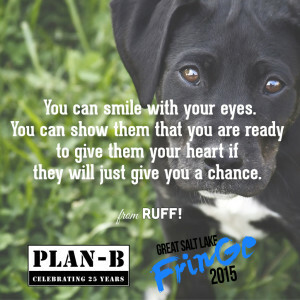 How does Plan-B see this fit into its overall mission of doing socially conscious theatre and to cultivate hopefully audiences which will begin to have a lifelong relationship with theater? Nii: I’ll let Jerry talk about Plan-B’s mission. What I will say is that I think one of the things we might be losing in this era of mobile devices and social networking is the notion of real people communicating, face to face. That what we do and say to one another can have an impact — for good or ill. I am passionate about theatre because it does this amazing thing where we go to a common place, sit near other people, and see stories and ideas played out in front of us by live people. It’s profoundly human. I fear what will happen to us if we lose that — if we stop coming together, sharing experiences together. Rapier: Cheryl Cluff (Plan-B’s Managing Director) and I both have children now. As anyone with children can tell you, having them changes the way you see and experience everything. For us, that includes how we activate and inhabit our mission. We discovered with Peter and The Wolf and Different=Amazing, our first two Free Elementary School Tours, that quite a few kids were having their first experience with live theatre through us. At first that was incredibly exciting. And then it became something more — a responsibility. Because if we can be the first, we may also be the only. So it’s important that our TYA programming be as affordable and accessible as possible. 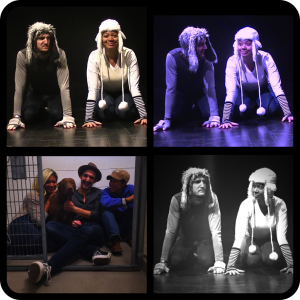 We’ve gone to great lengths to ensure that our performances of RUFF! are free. And it’s an awful lot of fun. TUR: The premiere takes place during the Great Salt Lake Fringe Festival and makes this play readily and widely accessible to as many people as possible in advance for a forthcoming school tour. Your comments about this new community venue would be greatly appreciated. Nii: It’s so cool that a story for schoolkids about two shelter dogs is playing at the Fringe Festival! I think it’s a testament to the notion that a Fringe life is open and welcoming. Rapier: Having Fringed twice before (Toronto’s Fringe Festival in 2006 and the New York International Fringe Festival in 2013) I was excited to learn that someone had taken the reigns and jumped off the Launch-A-Local-Fringe cliff. Over the years, I have had many conversations about the lack of Fringe here in Salt Lake City but they just remained conversations. It’s a daunting task. 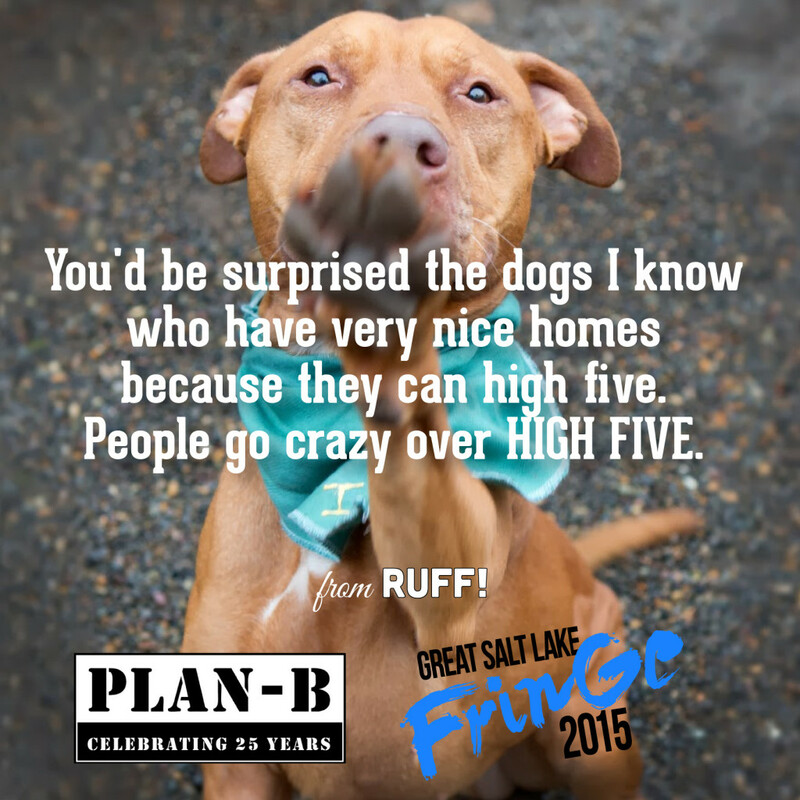 Shianne Gray, one of the Great Salt Lake Fringe Festival founders, was an intern for Plan-B last semester. As we worked together it seemed only natural for us to launch RUFF! at the Fringe. So we traded in our one free public performance on August 31 for six free public performances August 6-8 (Noon and 1:30 each day). And it just so happens that the first performance of RUFF! 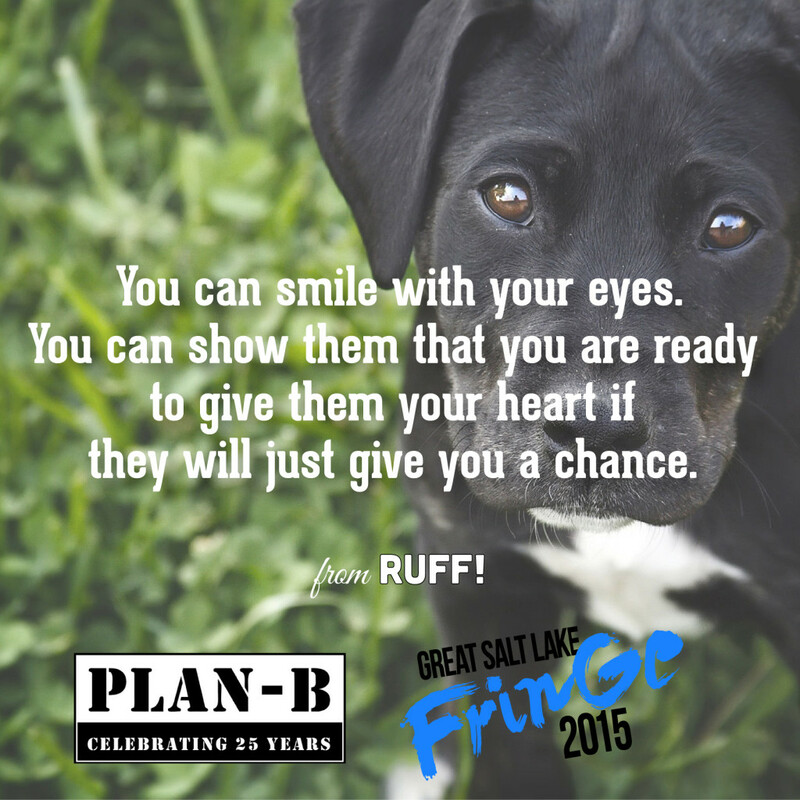 is the very first performance of the very first Great Salt Lake Fringe Festival!